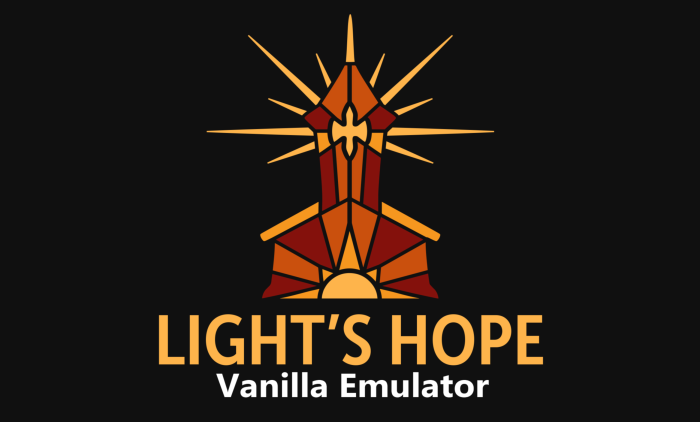 This as a complete repack of the open source Light's Hope emulator, with all of its features, including movement maps, anti-cheat protection, multi-language support, progression system, and even an optional custom mall located on gm island made by me. All of the maps are already extracted and the server is ready for use. If you want to run your own fully fledged vanilla server at home that is as close to the live ones as possible without having to compile and configure everything yourself, this is the repack for you. Keep in mind you need a decent computer to run this. I plan on updating the repack every month, so keep checking the thread if you want to be up to date with any new bug fixes. - Windows XP or newer. - At least a dual core processor. - Minimum 2 GB of RAM. - Open the batch file "Start MySQL.bat"
- Start the login server "realmd.exe"
- Start the game server "mangosd.exe"
It may take a while to load, so be patient. Remember to change your realmlist to 127.0.0.1 in order to connect to the server. You can login with admin/admin. To spawn the custom vendors and trainers at GM Island, you need to execute the file "Custom-GM_ISLAND_VENDORS.sql" located in "sql/custom" on the "mangos" database using a MySQL client program like HeidiSQL, or the batch script that i have provided for your convenience. Use the credentials root/root to connect to the MySQL database. The latest release of the repack also includes Adminer, which is a database management tool written in PHP. You can use it to make changes to the database from your browser after starting the included Apache server. Just type your ip address followed by /adminer.php and login with the information mentioned above. If you want other people to be able to connect to your server, you must change the ip address associated with the realm inside the realmlist table of the realmd database to the real internet ip address of the host machine. You can do this either with your own MySQL client program, with the provided batch script, or by using Adminer from your browser. The biggest selling point of this emulator is the fact that it has built-in support for patch based content progression. To change what content is available in game, simply change the WowPatch setting in the mangosd config file. This controls things such as what raids, dungeons, battlegrounds, quests and items are available, what stats do certain items have, what creatures are spawned around the world, how many players can enter certain dungeons, and so on with the only things not changing with patch being spells and talents, as that would require using a different client. esES locales are bad, in locales6 column there are creatures with simbols instead of ñ or ó, also in quest same. Thanks, but can you give me SQL files instead? That's a more proper way of replacing database values. Much respect. Was looking for this to Furthur my current elysium hack to bypass the AntiCheat =) this is a great post. Easy Simple. I would suggest however, maybe adding a simple guide o making a server public. I myself have had a few issues with thhis department, i used DNShosting sitee but it did not work. possibly a setting in my config. All you need to do in order to make your server public is open ports 3724, 8085, 3306 in your firewall or router, and change the realm's ip address to your real one in the "realmd" database, inside the "realmlist" table. Just the "address" column, not "localAddress". If you don't know how to connect to the database, you can use this batch file instead. Just put it in the server folder and use it to change the ip of the realm. But don't forget to start MySQL first! Can i insert a domain name in address field to make public? then i can use a no-ip for dinamic ip? What do I need to do to get it on the same itemization patch as Elysium PvP (1.3)? Itemization patches are in sql/itemization. I deleted the patches I did not want but that did not work. You are supposed to execute the ones you want just like any other sql file. You can use HeidiSQL to do that. [Repack] OpenBasic Core 3.3.0 + Custom DB. and more! [Tutorial] . :Introduction to MattePainting:. Includes Definition and Examples.